After completing pattern drafting for Skirts, I decided to move forward with Moulage. 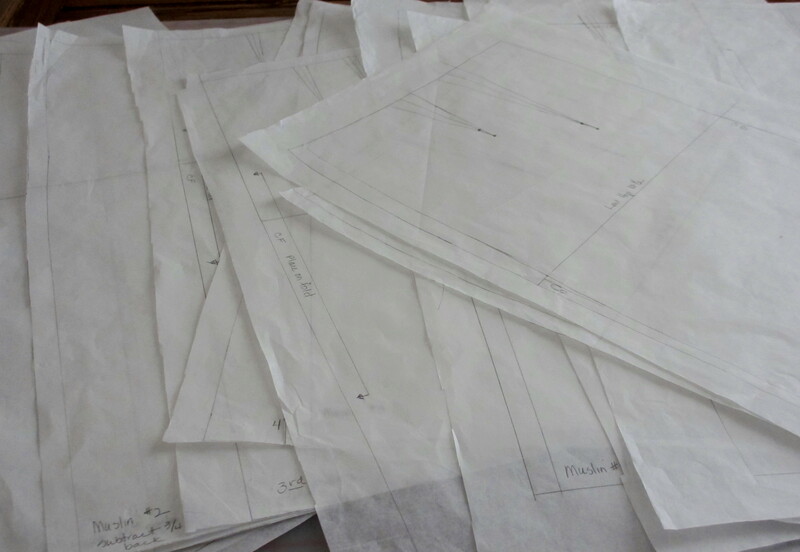 With pencil and eraser nearby, I began translating my measurements onto paper, the end result would be a “mold” of my body to assist in garment construction. First, I needed to draft a Foundation Block front and back in order to draft a custom moulage of my upper torso. Once completed, I drafted a bodice sloper of my front and back, and mounted the two on oak tag. The text book used for class, Building Patterns, The Architecture of Women’s Clothing, written by Suzy Ferrer can be a bit overwhelming given the amount of technical information. A semester of instruction would definitely explain, in detail, the technical aspects of this informative book. It was an intense experience, but also rewarding. I am proud of my accomplishment. try try again. My journey back into sewing all started with an unsuccessful trip to the mall. The mass produced garments hanging on the racks, sewn out of low quality fabric, and lacking style and fit did not deserve a visit to the fitting room. I briskly walked to my car and could not wait to arrive home because tucked away in several storage bins in my attic were options, Swiss cotton, Italian cotton, wool and silk. It just so happened a pattern drafting Skirts class being offered at Eddie’s Quilting Bee fit my schedule. 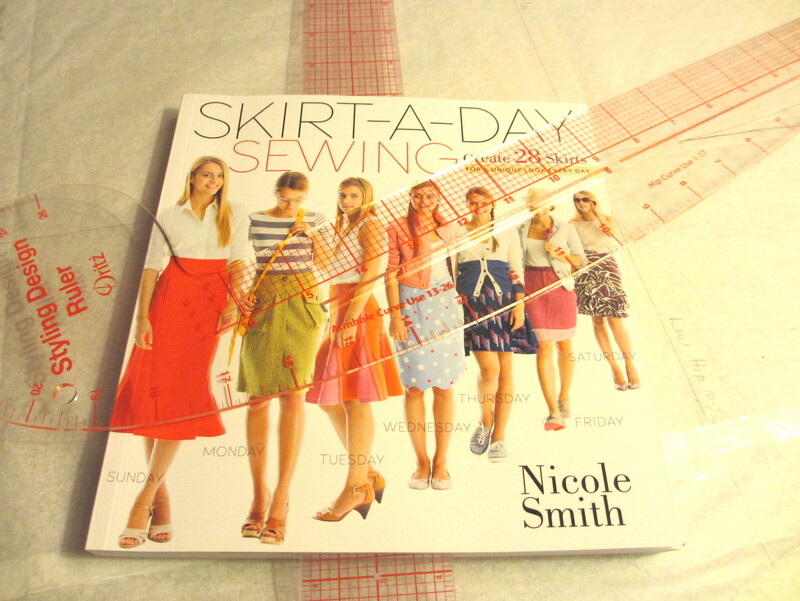 By implementing Sally-Ann’s instructions in conjunction with Nicole Smith’s, Skirt-A-Day Sewing, I drafted a skirt foundation block using my low hip measurement. Upon the completion of the skirt block, I drafted a two-dart sloper. At this point, Sally-Ann mentioned, “Sometimes in takes three to eight muslin to reach the final draft.” My first draft needed alteration. 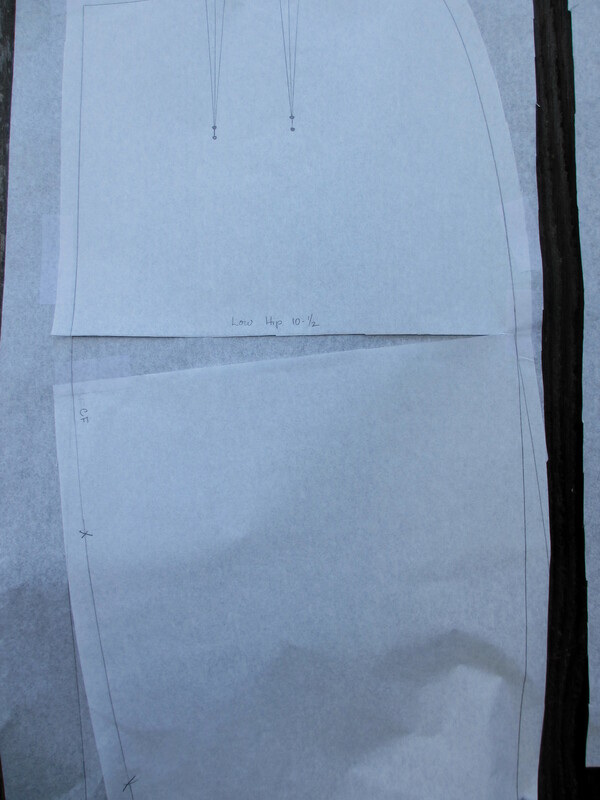 After taking 2″ off the waist and 1/4″ off below the low hip, I drafted a second sloper. The second muslin side seams pointed out that my hips tilt forward. Sigh..Back to the drawing board. I drafted 3/4″ off the back and added it to the front. The third muslin did not hang even. I have one hip higher than the other. I proceeded to cut and pivot the front by inserting 1/2″ at the low hip measurement, and inserting 1/4″ to the back. The fourth muslin back did not require any further alterations, but I needed to pivot the front by inserting an additional 1/2″ for a total of 1″. 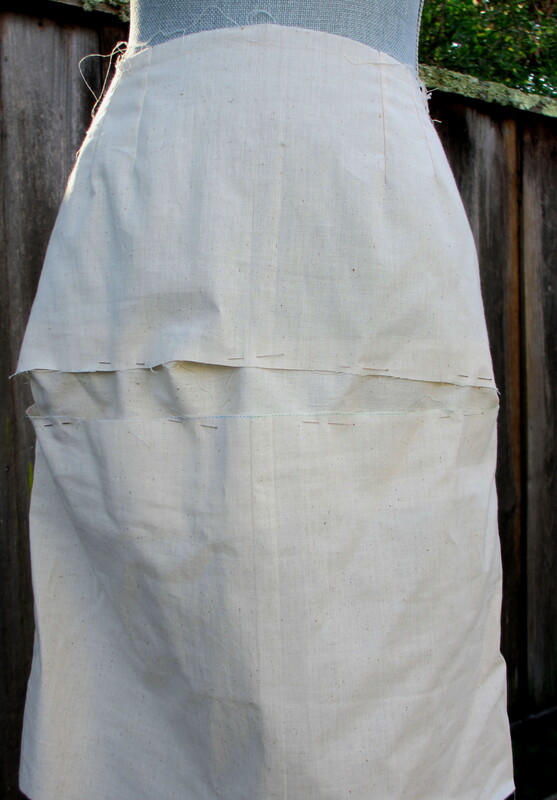 The fifth muslin front and fourth muslin back are perfect… ten drafts later. The final copy of the final sloper needs to be mounted on poster board with spray adhesive. On to the next phase, A-Line Skirt.